You may have noticed on Twitter I've been tweeting away about this new 'me', this new changed 'diet' I am on etc etc and I've been getting a few questions about it so I thought it was about time I did a good old blog post to explain myself! First off I just want to say - I am not on a diet. Nope, I refuse to say that word now - I have just decided to permanently change my eating to hopefully change the way I feel inside and the way I approach/look at food. I was given a huge kick up the backside recently when I read Scarlett's 6 Month Food Transformation post - reading her thoughts, feelings and experiences was like reading a diary of my own. I read so many similarities and realised that 'Hey, maybe I'm not the only person that feels like this' and I don't actually have to feel like it at all, it CAN be avoided. For years I've known the foods I have to avoid. Alot of people in my life call me fussy which I can find really embarrassing. I can't eat certain foods... kind of not my fault - it's not my choice, I don't want to be fussy, but that's just how it is. I'd rather be that way than be ill.
My tummy troubles have ruled alot of my life since I was a teen, thinking through everything I ate, panicking about going out to eat somewhere new or going to people's homes for dinner - sometimes I would do anything to avoid these situations, in fact, I still do. The diet I had was poor. 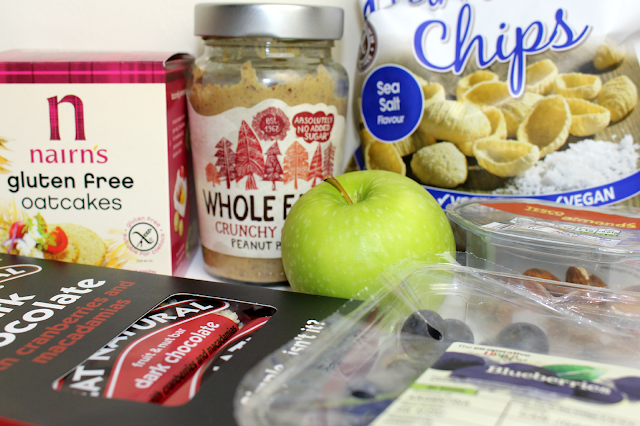 Alot of sugar, way too many snacks and not enough fruit and veg... nowhere near enough. 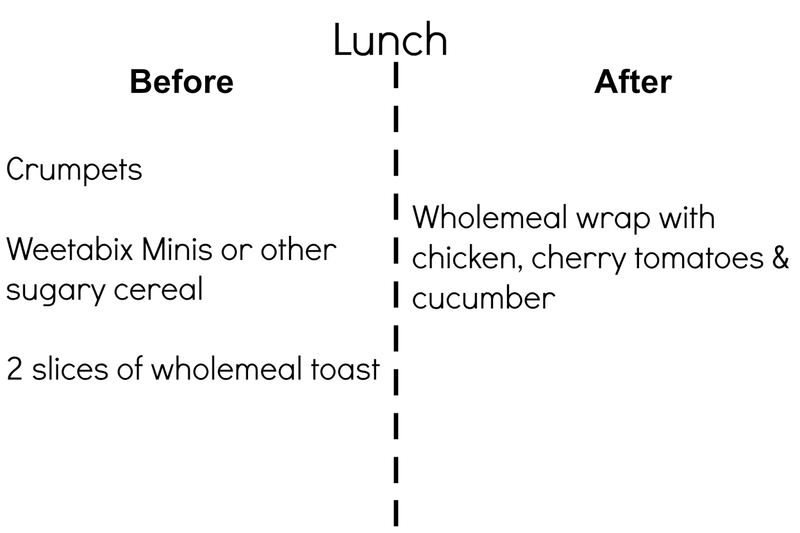 I was lazy, I would just eat the most convenient easy dinners and fill myself up on unhealthy snacks like biscuits, chocolate and sometimes crisps which I would then totally regret and in all honestly would just want to throw up as I felt so full and disgusting. I would decide to diet every other month and maybe loose a few pounds but it would be a stupid diet. One where probably wouldn't eat enough and get so bored that eventually I snapped - it just didn't work. 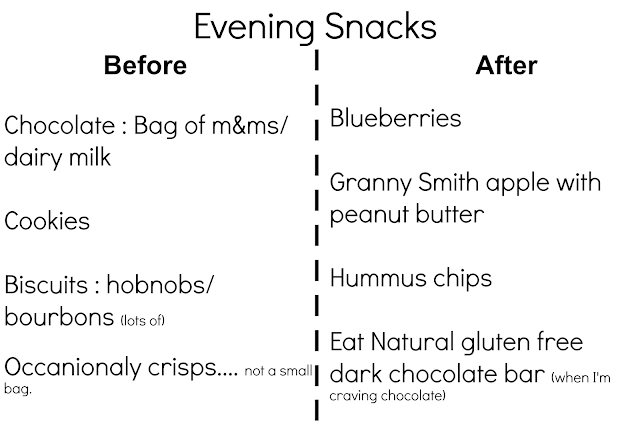 So that Sunday evening 2 weeks ago after reading Scarlett's post I kind of had a food epiphany. I needed to actually start looking at what I was putting into my body, cut the crap and unnecessary over-eating and maybe just maybe I could actually feel normal for the first time in years. This isn't about loosing weight, it's about becoming healthier and happier and after only 2 weeks I already feel a total difference, I'm eating enough and of the right stuff, I can't believe I've been letting my body go without this for so long. So.... 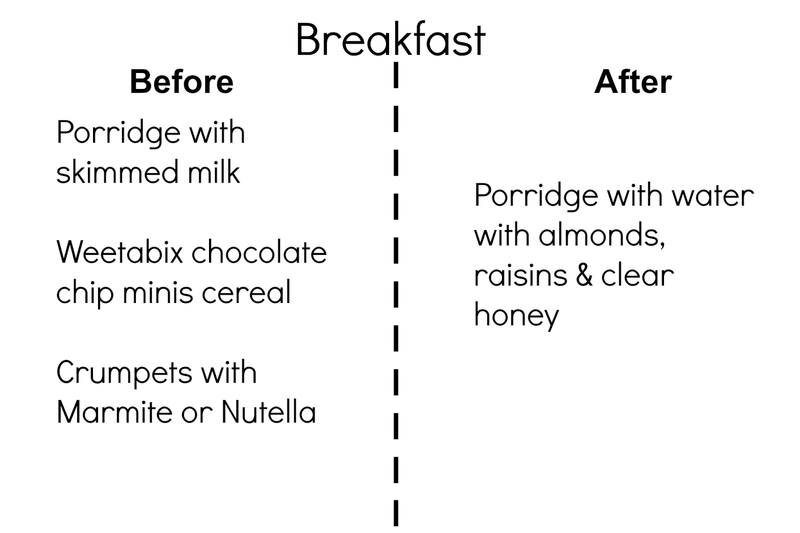 I've cut out main dairy products like milk, cheese, mayo and eggs, avoided unhealthy processed snacks full of sugar and salt (which I was kind of addicted too) and tried to increase my protein, fruit, vegetable intake as much as possible. So far I feel brilliant, no tummy aches, no sluggish feelings and I'm feeling alot more positive! It's amazing what just a few changes can do. I won't lie... when I was hungover I had a bounty .... but we can let that go right? haha! Could have been alot worse. I've avoided the biscuits that are still in the cupboard, which is kind of a miracle and I'm bought 2 birthday cakes for people in the last fortnight and not had a single slice! 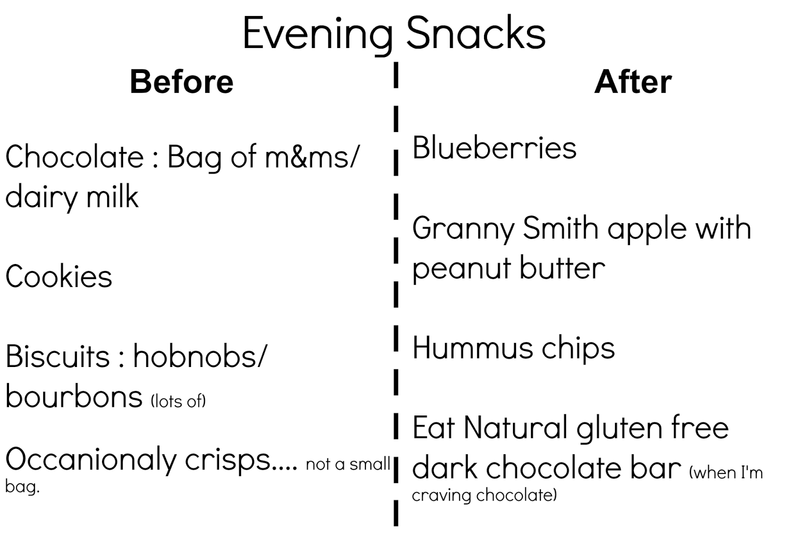 I've found what I'm eating really does keep me fuller for longer, I'm not thinking of snacking half as much as I used to. I've already lost 4lbs which is a total bonus and I can't wait to add exercise into this new life routine of mine! I just struggle to find the time when I'm at work 9 hours a day and trying to blog on my days off. I'll be keeping you all updated on my journey and this 'new me' - so far I'm SO happy with how I feel, I can't imagine ever wanting to pop into a shop and buy a family size bar of dairy milk to stuff my face with again - which can only be a good thing. Don't get me wrong though, of course treats will still happen. I'm not going to let myself go without popcorn at the cinema - that would just be rude! Well done Kirstie! I've started slowly making changes to my diet & feel a lot better for it. I just need the motivation! Well done. So proud. 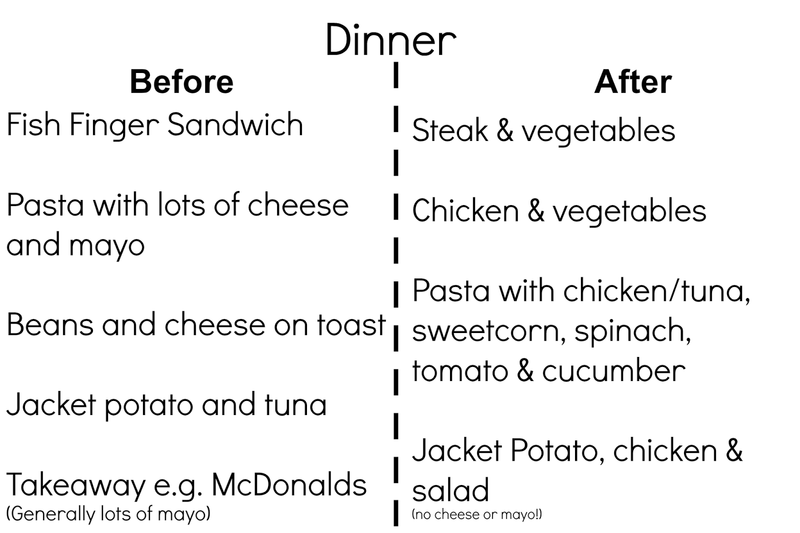 I've noticed your tweets about needing to change your diet (I've probably favourited a couple haha) so glad you're feeling better and losing weight! It's great to see that you're feeling better from your new lifestyle change :). 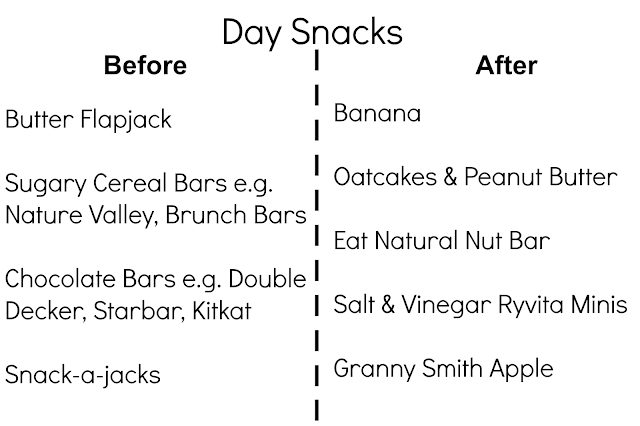 An interesting read - I can definitely take some of your snack swaps on board! good for you! I went through a similar change and lost sooo much weight! I definitely feel miles better now than I did 2 years ago!